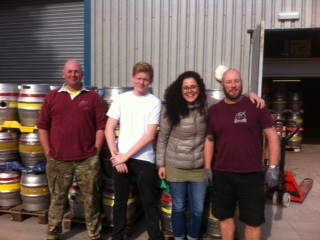 Hunter’s Brewery have teamed up with Torbay Innovation Centre (TTPL) and have taken on two Foreign students to do work experience with us here at the brewery. Here we have Malte who is from Germany and Silvia from Italy, We hope they are enjoying their time with us here at Hunter’s. Malte says he will go home with very strong muscles, brewing is hard work! Silvia is loving the bottling line! We here are very please to have two wonderful workers. TTPL was established by CEO Jayne Stroud in 1996, with the specific purpose of providingproviding a safe environment for young people who undertake vocational programmes far away from homefamily and friends. For oOver 18 years we have successfully established a reputation for providing exceptional work experiences placements with a lively social programme. We encourage personal growth and cultural awareness whilst maximising individual employability opportunities. We collaborate with over 60 partner organisationss worldwide and are proud that some of these relationships are 16+ years old. Our partners can rely on us to provide the best experience possible with excellent personal service. In 2013/14 we successfully hosted nearly 2000 participantstrainees, providing paid and unpaid work placements, bespoke training and language study programmes. We have a database of over 400 homestays and 500 employers, which is growing increases every year as we move into new sectors and expand across the South West. TTPL now employs 15 office and teaching staff, all focused on providing the best time possible experience for every trainee. that comes to the UK.